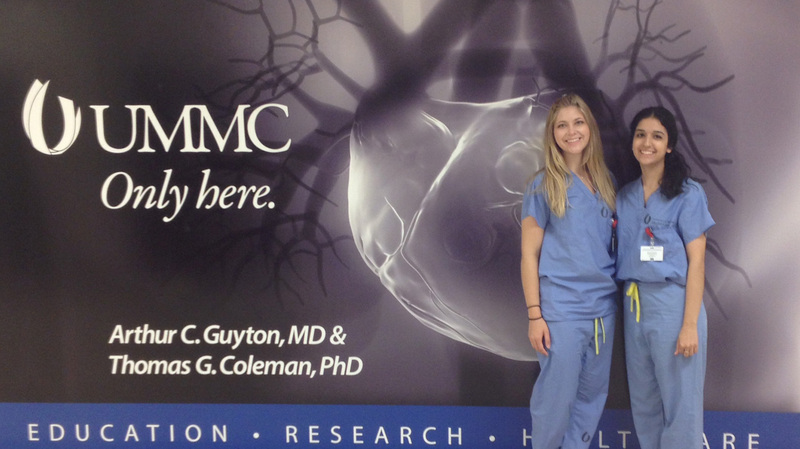 Two students in the School of Engineering took full advantage this summer of an opportunity to closely shadow physicians at the University of Mississippi Medical Center, thanks to the Sally McDonnell Barksdale Honors College’s Physicians Shadowing program. Juniors Roya Gordji, of Oxford, and Joella Vaughnn, of Rockville, Maryland, spent a month shadowing and observing physicians working in a variety of areas. The program is meant to give prospective medical students, regardless of major, a chance to personally experience the fast-paced environment of a hospital. The Honors College provides stipends to assist students with living expenses in Jackson during their rotations. A general engineering major, Gordji became aware of the program through the Honors College’s weekly newsletter when she was a freshman. Gordji and Vaughnn shadowed in the emergency and anesthesia departments in separate two-week rotations. Both observed a variety of real-life situations and interacted directly with physicians. “The ER was fast-paced and the cases that came in were really interesting,” Gordji said. “I saw cases that varied in severity from a black eye to a crushed foot. The doctors were also very happy to teach. A chemical engineering major, Vaughnn learned about the program after seeing it on the Honors College’s website. “I am going to need the engineering analysis tools to solve problems in medicine because medicine is not about having the perfect answer; medicine is about recognizing similarities between cases in order to help the patient as much as you can,” she said. Her experience gave her a better sense of the hospital environment and of areas that fit her interests. Initially, Vaughnn planned on becoming a neurosurgeon, but after watching three different neurosurgery cases, she quickly changed her mind. Her favorite types of surgery to watch were knee, hip and shoulder replacements. Before participating in the physician’s shadowing program, Gordji spent last summer doing computational research that involved designing tumor-targeting nanoparticles. She was able to present her research at the 2013 Mid-South Annual Engineering and Sciences Conference. This fall, she begins research for her honors thesis. She also completed UMMC’s Community Health Advocacy Program and volunteered at Northeast Mississippi Baptist Hospital ER as an ambassador for the School of Engineering. Vaughnn participated in a medical mission trip to Bolivia, where she organized a handout of reading glasses to a local tribe. She is also actively involved with the American Medical Students Association and her social sorority. Research for her honors thesis combines her interests in engineering, medicine and art. Both students plan to apply for medical school during the upcoming academic year.